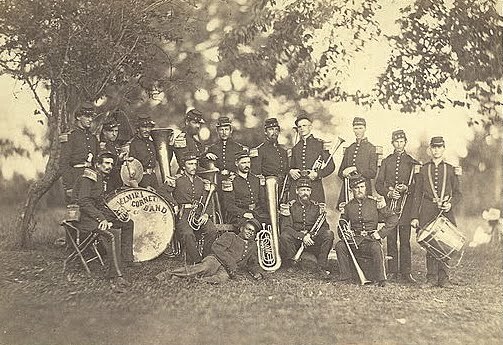 Band of the 8th New York State Militia, which the Fencibles Band would have resembled. While the 79th Pennsylvania resembled other three-year volunteer regiments in many regards, a couple things about the regiment made it unique, such as fighting in the Western Theater, having almost all soldiers coming from the same mid-sized city, and possessing various idiosyncrasies related to Pennsylvania Dutch Country. One other unique attribute was that the regiment had a supposedly really good band, the Lancaster Fencibles Band. The Fencibles Band had achieved local celebrity status well before the war had started, bringing an air of excitement to all sorts of civic occasions, and traveled with the 79th Pennsylvania to Kentucky, Tennessee, and beyond. 10/19/1861: At 7 a.m., the fog having disappeared, we again moved down the [Ohio River by steamboat]. In passing Wheeling our band struck up attracting the attention of the people of the town & soon there were several hundred persons upon the shore & upon the splendid wide bridge spanning the Ohio there listening to the music as it echoed on the shore. This is a splendid moonlight night. 9/17/1863: 1st Brig, takes advance at 6 A.M. We are rear guard. Our Regt. rear of all wagon trains. Cross creek at sawmill.. Left camp at 9½ A.M., roads good. March slow. Cross Ala. & Ga. line, band playing Dixie, at 12 M.
3/14/1865: Wrote to Father a brief sketch of our campaign. We have been out 54 days & marched 395 miles. Lieut. James H. Marshall, Major Locher & some Officers from Brig. Hd. Qrs. took the band & serenaded Gen. Sherman, who said, among things, that in 3 days we would connect with Gen. Schofield.